Come and join us over at Artypants for an exciting competition called Scrap Your Pants Off. Saturday 3rd October – Thursday 16th October* To receive access to the SCRAP YOUR PANTS CONTESTANT Forum which will have competition tips and other information you may need, you need to register your interest in the 'REGISTRATION' thread in the Scrap Your Pants off forum. Friday 17th October – Sunday 29th November 6 NON-ELIMINATION ROUNDS and then a SCRAP OFF between the top 3 or 4 in the 7th week to determine the Winner. Weekly Prizes: Challenge Twist: Awarded to the contestant who gets the most votes each week. They will receive the following weeks challenge 1 day early AND add one more criteria giving them an edge. Store vouchers, ArtyPants products & RAKS are all up for grabs and awarded by the DT & GDT. They will be voting for prize winners based on CONSISTENCY, IMPROVEMENT, SKILL and OVERALL DESIGN so even if you aren't leading on the leaderboard, you are still in with a chance for a smaller prize.Participation in challenge games set by the DT & GDT, regular forum posting and participation and uploading non-challenge layouts to the gallery may also attract prizes and RAK as determined by the DT each week. Visit the Artypants forum here to get more information on Terms and Conditions. This will also take you to the Artypants forum where you will be able to register. These are the layouts I completed for the Design Team project for Septembers add on kit available now at Artypants. Click here to enter the website to order your kit. Maybe I've found my mojo again. OMG it's been forever since I've updated in here. It's feels like forever since I've done any scrapping. Have found my mojo again though and hope to be finding more time for me to scrap, ontop of running my photography business. Some new layouts will be shared soon. Check out my photography blog or my Andrea K Photography page on facebook. An awesome competition is coming to Artypants. Watch this space to find out how you can have 3 monthly kits delivered to your door for free. You can also find out more information on the Artypants blog or the Artypants forum. Because I never get a chance to update this blog with the diary of my life I have decided not to continue it in that format. It is now a blog purely for my scrapbooking. People these days keep up with my life's happenings on Facebook, so if you want to keep up with these updates, find me on Facebook, if you haven't already. I also have another blog I am updating, which is my photography blog. Click here to check that out. I am also an author on the Artypants Blog. So I'm pretty busy with blog and facebook updates that I just can't keep up with it all. This layout was done at a crop night a few weeks ago and it's taken me this long to finish it and photograph it. 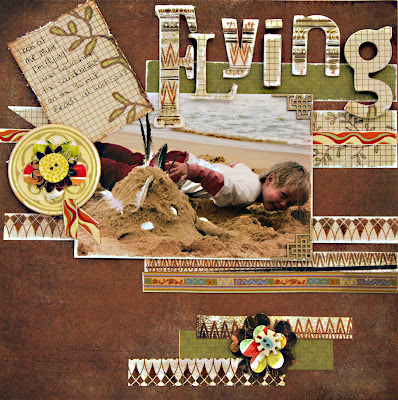 This layout was done at the Artypants retreat. It's the follow the leader challenge set by Jodie, but as usual I never end up following the leader. This is my interpretation of the instructions. I never got to see Jodie's sample but I don't think mine looks like Jodies from what I can gather. This layout was also done at the Artypants retreat. This layout was done for the 'Scrap the Quote' challenge set by Laura on the Artypants forum. The quote I used was "Go Confidently in the Direction of your Dreams, Live the Life you have Imagined" It's the perfect quote for my venture into my photography business. The envelope holds some affirmations for me to keep me on my path. 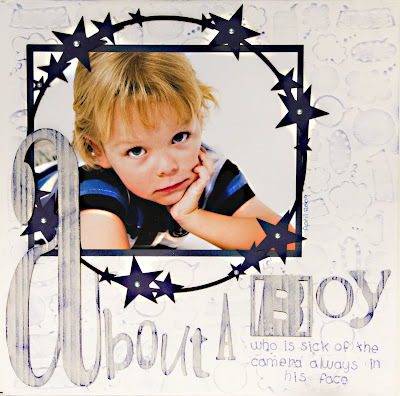 All content (including text,cards, photographs, and all design work) is © to me -Andrea Klaster and the scrapbooking store Arty Pants and Alison Ellis Designs. My original artwork is for personal inspiration only and may not be copied for publication or contest submission. For your own Photo Shoot contact me on: 9705 0601 or 0438 653 082. You can email me at andrea.mk02@hotmail.com About me: I have 2 gorgeous children, Micayla 8 and Bailey 5. I have successfully completed my Diploma in Photography. Photography is my passion and I am one of the lucky ones who gets to work my passion. My hobby is Scrapbooking. 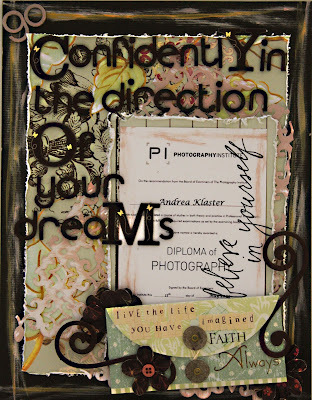 I have had my scrapping published in all 3 Australian Scrapbooking magazines. I am a Design Team Member for Artypants and Alison Ellis Designs. I have also held a couple of Guest Designer positions. I occassionally make and decorate cakes mainly for friends and family, which is horrible because I usually see my creations being destroyed by the knife. Thank you to my VALUED friends and visitors for visiting my site.